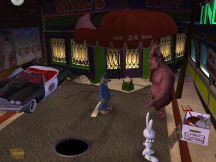 Sam & Max 205: What's New, Beelzebub? What can we expect from Telltale Games’ new offering and final chapter of Sam & Max Season Two? With a title such as “What’s New, Beelzebub?” will we see a musical Satan gyrating his hips as Tom Jones once did? Uhm…no, sorry. However, what we do get is another raucous rollercoaster ride full of innuendo and yes, sometimes even outuendo from the previous five episodes of Season Two. Now those of you who have kept up with the last episode’s cliffhanger will find that our intrepid duo are still trying to save the paranoid and long-suffering Bosco’s soul. The story opens with our loveable dog and rabbit, followed closely by a very dead convenience store owner (Bosco) and the illustrious, albeit rather pompous chicken (Mr. Featherly) landing in a mysterious yet somehow familiar subway station. As a triangular space portal hovers overhead, the portable AI (ala HAL of 2001 fame) announces that the spaceship will self-destruct in seconds. 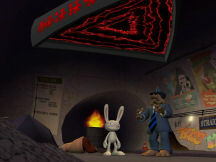 Yet we hear no explosion...hmmm did Sam & Max finally meet with their own demise? Are they about to meet their Maker? Are they really on a tributary of the River Styx? If so, where’s the “damned” boat? Is the River Styx really the largest in the world or is it just an extension of the great Missouri? Why are there mountains of garbage here? Is it just that we are in the city where the refuse of the ages can sometimes pile up? And why does Charon look suspiciously like Harry Moleman? Ahh yes…important questions all, to be sure…okay, well maybe not all of them. I must give points here for the way in which the adventure begins. We open with a fascinating cut scene and start straight away into the interaction of the game. Our boys must eventually find their way into the corporate offices of Hell to chase after Bosco’s soul. It is only after they realize just what steps they (and you) need to take in order for them to get there, that the opening credits role, as does their beloved Desoto, the music commences and the devious fun really begins. And when they finally do arrive, just who do you think is there waiting for them, working as a receptionist? That Eurotrash undead child of the night, our friend Jurgen. As a matter of fact, you will be quite pleased to note that many of the main characters and villains of Season Two have been well placed in this finale. Who are they? Well, they are legion…. Now, because of all I’ve just leaked to you, does it follow that you simply cannot understand this episode without the previous four? Only slightly...this still is a fine stand-alone game, however if you do decide to play this game without the rest of the season under your belt, I’ve a feeling that you’ll want to play the others, because the storylines are as intriguing interlaced as they are addictive. The puzzles, as in the previous episodes, are inventory and story based. I do believe that Max’s hints are devilishly delightful -- although remember it is Max’s thought process that proposes these hints…’nuff said. However, those of you who know and can remember the previous storylines leading up to this finale will have the advantage in solving them, especially in the “Soul Room.” But then, being “The Father of Lies,” the Devil may care. Although the look of the adventure has not changed throughout Season Two, it still does not disappoint. The palette is as brilliant as ever, lending a certain assurance to its comedic vibrancy. The “Options” page remains the same, offering the user changes for graphics, resolution, audio, subtitles and hint levels. There are no abrupt endings, dead ends or other such frustrating nonsense within the technical aspects of the adventure, and the developers still offer an automatic save system along with unlimited manual saves. Be assured that any timed sequences or wrong turns are repeated automatically or can be corrected within the confines of the storyline. I must say that while playing, I found that the script offers no holes in the plot at all, despite the story’s complexity. This is a true credit to the writers, and this gamer has nothing but admiration for the work (though diabolical at times) and wild abandon they have undoubtedly poured into the game. They had me “By the ruby red goiters of Rube Goldberg” for most, if not all, of the adventure. I must also give an appreciative nod to Jared Emerson-Johnson, who does the music for this series. 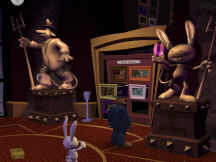 His style and panache work beautifully with Sam & Max, like a creamy caramel sugar-spun web laid upon the richest of devil’s food cakes. Yum! A case in point was a beautifully haunting corruption (ala Kenny G) of Amazing Grace. Keep in mind that the musically challenged may not be able to recognize it at first or second … but it is oh, so deviously there. Where is it? Well, that would be telling now wouldn’t it? Once again the writing, plot and character development are strong points for the game. Yet it was the dialogue and voice talent which grabbed me with this season finale. No villain was left unscathed from throughout the season. The crispness of the repartee had me in gales of laughter on more than the odd occasion. Absolutely brilliant. The amount of work that went into this last episode is indeed apparent. The inside jokes and insane lunacy that permeate “What’s New, Beelzebub?” is immersive, fiendishly delightful and a gleeful joy to play.